Hawaii residents consume nearly 7 million cans of Spam each year making it the state that buys more Spam than any other state. That’s nearly 6 cans of Spam for every resident every year. 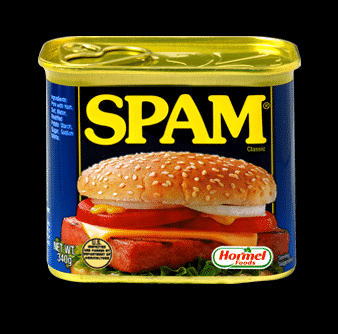 You’ll find Spam in restaurants all over the islands, particularly in restaurants that serve breakfasts or in just about any well loved greasy spoon. Even McDonalds and Burger King have Spam items on their menus in Hawaii. Step into a 7-Eleven convenience store in Hawaii, where you’ll likely find a sushi-style version of Spam called Spam Musubi. (See this link for a recipe for Spam Musubi.) By the way, if Spam Musubi sounds familiar, it might be because it was widely reported that President Obama snacked on the island delicacy while playing golf on Oahu in December 2008. As if I’ve not already convinced you of Hawaii’s love affair with Spam, maybe this final fact will finally do the trick. Waikiki hosts a day long street festival celebrating Hawaii’s favorite canned meat. This fun event, Spam Jam, is held annually usually in April or May. @ Dave – so you think 6 cans is not an accurate measurement? Hmmm…the stat came from reliable sources. Wow, I live in the town that makes spam in Minnesota, im 21 and Ive never even tried it before. Maybe when Im down there i’ll have to see how it is. Kevin – Hawaii loves SPAM so much they even invented a sushi version of SPAM called SPAM musubi.